First full year Willamette hop plant. I have been logging my hop growing saga for the past few years: 2010, 2011, 2012 and 2013, typically with multiple entries. I have decided to try my hand at a 2014 update. Hopefully one of several (at least the harvest). The cold weather in the are this winter gave me doubts on how well the plants would take off. The Mt. Hood was the early winner. 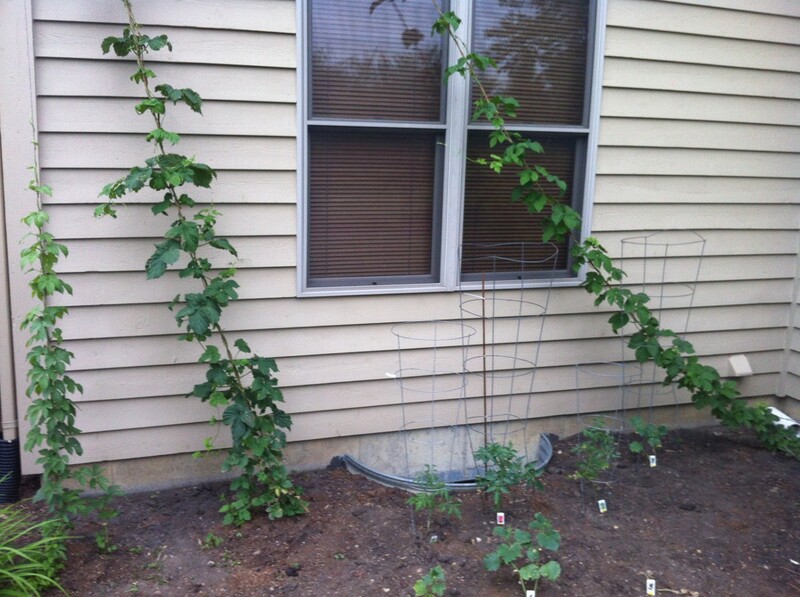 It had one bine climb to 20 feet in a matter of week with the bine as thick as the rope that it is clinging too. This is the third full season for the hop and bar far the best. There are two other bines climbing their way up the rope as well. It is already starting to push out a few flowers for cones. I am contemplating nipping but I will probably just let it go as the cones are usually small from this plant. Cascade, in it’s second full season, isn’t far behind. The strongest bine is close to 20 feet with two others very close behind. Last year this plant produced the best harvest. 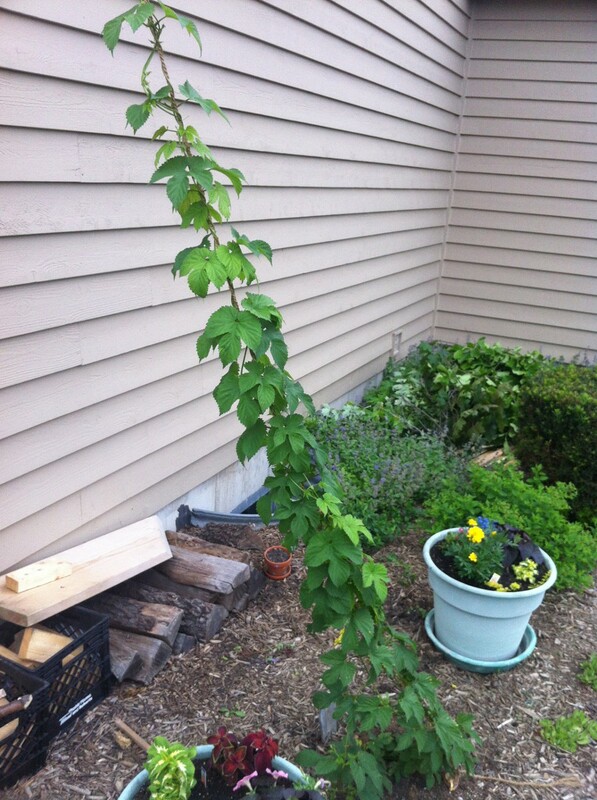 I hoping for another stellar crop for my second annual hoppy Saison late summer brew day. Centennial, Mt. 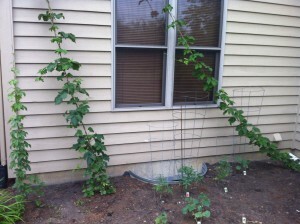 Hood and Cascade hop plants. Willamette, around the corner from the others and by itself, is a mere 10 feet tall but about what I expected from the first full season plant. A nice crop of this hop will add nicely to the Cascade hop additions. Centennial has been my biggest bust. It typically seems to have an issue. Last year there were two with the second issue snapping the bines. They sure do dry up quickly once cut! This year, per typical, this plant is growing bunches of mini bines that I have to cut back, trying to coax two or three to stand out in the crown and grow. The two strongest bines are slowly approaching five feet. Needless to say I am not expecting much. Four plants is the most my wife has allowed me to grow at one time. Excitement for the Cascade and Willamette will hopefully not be wasted. Enjoy! Useless Fact: Nutella was invented during WWII, when an Italian pastry maker mixed hazelnuts into chocolate to extend his chocolate ration. You are currently browsing the Sips blog archives for June, 2014.